Our vets answer common questions about neutering. My female pet should have a litter before she’s neutered. No – there’s no need for your female dog, cat or rabbit to have a litter before she’s neutered. There’s no emotional benefit for your pet if she has a litter before she’s spayed. In fact, medical evidence shows that spaying before your pet's first season has the most health benefits. For example, every time a dog has a season, her chances of developing breast cancers in later life increase, and 90% of unneutered rabbits develop cancer of the uterus (womb) by the age of 5 - so neutering your pet while they're young is a great step to helping keep them healthy into old age. If I neuter my pet, they’ll gain weight. No - only overfeeding and under-exercising cause obesity. Dogs: adult dogs need fewer calories than puppies, so make sure you’re feeding your dog the right food for their stage in life. We’ve got more advice on the best way to keep your dog at their healthy weight. Cats: make sure you’re feeding your cat a diet for adult, neutered cats. You can encourage them to exercise by playing games with them, which most cats love. Get more advice on keeping your cat at a healthy weight. Rabbits: rabbits are less likely to put on weight if they're fed a diet as close as possible to what they'd eat in the wild - we recommend that hay should make up 90% of a rabbit’s diet and 10% should be a pelleted food and fresh greens. Read more about how to keep your rabbit at a healthy weight. Getting my pet neutered will change their behaviour or personality. No - your pet’s personality is dependent on their genetics, not their hormones. Certain types of aggressive behaviour. Urine marking in the house. Male cats and dogs roaming away from home. Behavioural changes and stress associated with coming into season. However, Neutering won’t change any underlying behaviours in your pet – good or bad. The best way to change these behaviours is through training and making sure your pet’s home isn’t causing them unnecessary stress. If you’re worried about your pet’s behaviour, it’s always best to speak to your vet. Neutering is a risky and painful operation. Neutering is carried out by vets every day and your vet will make sure you pet isn’t in pain. Your pet will need to go under general anaesthetic so they’ll be asleep during the operation. 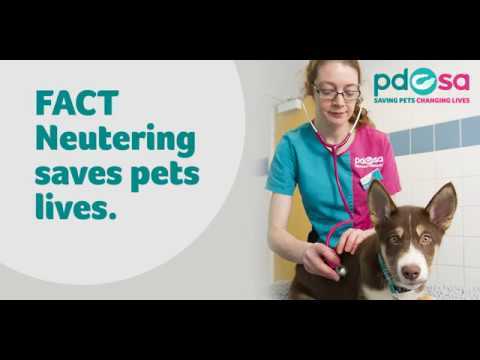 While any operation carries some risks, it’s much safer for a younger pet to go under anaesthetic than it is for older pets, should they face health problems due to being unneutered. Your vet will give your pet pain relief to keep them comfortable. I’ve got an indoor pet – they won’t get pregnant or father a litter so they don’t need to be neutered. Neutering isn’t just about stopping your pet from having babies – there’s a whole host of health benefits too. Pyometra (a serious womb infection). Neutering greatly reduces the risk of your pet suffering from these diseases. It’s an important step towards giving your pet a happy, healthy life. Find out more about the health benefits of getting your pet neutered. Vaccinations save lives - find out what they protect against and why regular boosters are so important. Getting your pet microchipped means you can be reunited if they are lost or stolen.